Past Issues are available from June 2008 through the current issue. Select the desired issue from the drop-down box below. I never knew him well because I was five when he died. My memories, though vivid, are few. Yet, like collecting fabric for a patchwork quilt, Ive discovered swatches which, help complete the pattern. With scraps from my own memories and pieces shared by others, I treasure a tapestry which, vividly shows me the man my father was. One of my favorite quilt patches, sewn lovingly by an aunt, is the story she shared in a letter for my son. We chose to have our second son, Timothy, carry the middle name of Floyd in honor of my father. After Timmys birth, I wrote my fathers sister Rhoda, the youngest of eleven children, to ask her for memories that I could later share with Papas namesake. She responded with many pieces of fabric, woven together in a letter. I enjoyed all of Aunt Rhodas story pieces, but the one I like best is the patch she shared about the day he helped with threshing. Ive been told by many folks that Floyd J. Miller was a man ahead of his time; that he would have loved computers and statistics and analysis; that he was often referred to as the Amish lawyer; that he had once said the farm on which he lived was too big to starve on and too small to make a living off of; that, during maple sugaring time, he made a cozy nook in the corner of the sugar camp where he could read while firing the furnace; and that he would rather have had his head in a book than be farming. Yet here he was, working shoulder to shoulder with other men as part of a threshing crew. The fabric of this particular story illustrates the intriguing way my father approached life, so like my own son, his namesake. Floyd liked to give a person a clue about something and then make him figure it out for himself. It was threshing day on the farm along the river. As was the custom, men worked in crews, going from farm to farm to help each other during threshing season. 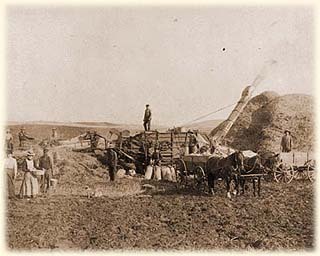 In those days, it took quite a crew of men to complete the job of threshing grain. Coal ranges were used for cooking. 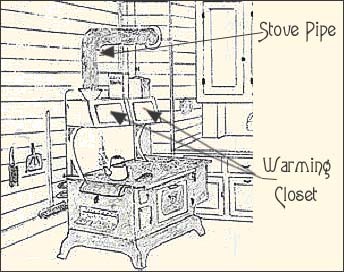 There was a warming closet above the range where food was kept hot from heat in the stovepipe. Ovens were not used so much for roasting, and meat was boiled. On this particular day, the threshing crew was at the home of Floyds oldest sister. With the help of other women, Alma spent the morning fixing her meal: a kettle of chicken cooked on the stovetop, mashed potatoes with gravy, corn, green beans, homemade applesauce, homemade bread topped with homemade butter and jam, fruit, and a variety of cakes and pies. As the men filed into the house to wash up before dinner, Alma took the chicken out of the broth and placed it in the warming closet while she made gravy. Other women assisted getting the food dished into bowls so the meal would be ready when the men sat down at the table. After the Amen had been said, bowls filled with sumptuous food were passed around the table. Men spooned hefty helpings on their plates, conscious that their days work was only half over. Why is that? his sister Alma queried, with an ear for anything the men folk might need at her table. She saw the twinkle in his eye and knew that Floyd was being, well, just Floyd. Alma left the room quickly and bustled to the kitchen. 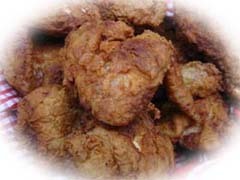 She removed the forgotten chicken from the warming closet and return with a platter heaped high of cooked chicken. The men were offered more than the substance of things hoped for: they were served chicken with their meal. Im not sure why I like this swatch the best. 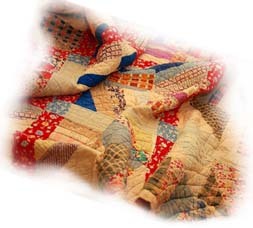 Perhaps it is because the thread lends a unique design to my patchwork quilt. Maybe it is because Ive seen the same traits in my son, his namesake. Or could it be that Im drawn to the stitching that is much like my own? Im not sure; but I know when I hear the description of faith from the book of Hebrews, I smile as I think of chicken gravy and my father. And, like a contented child, I snuggle down under the warmth from the tapestry of memories in my heart. 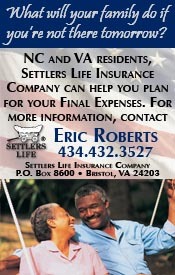 Born and raised in western Maryland, Gertrude Slabach has claimed Southside Virginia as home for over twenty four years. She is an RN and works part-time at Fuller Roberts Clinic in South Boston, Virginia. 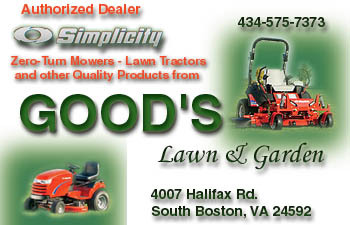 Gertrude and her husband Dave have six children; four sons and two daughters.